Focal aorto-iliac atherosclerosis amenable to endovascular interventions though considered benign carry a significant risk of cardiovascular mortality: clinical investigation. Ioannou C, Kostas T, Kontopodis N, Manousaki E, Chlouverakis G, Kehagias E, Tsetis D. Int Angiol. 2015 Feb; 34(1):67-74. Epub 2014 May 13. Overcoming the venous outflow obstruction in true venous aneurysms of arteriovenous fistulae can lead to aneurysms' remodeling and shrinking. Georgakarakos EI, Kapoulas K, Kostas T. J Vasc Access. 2012 Oct-Dec; 13(4):538-9. Venous hypertension due to outflow stenosis in a Gracz arteriovenous fistula: correction with distal cephalic transposition. Georgakarakos EI, Kostas T. J Vasc Access. 2012 Jul-Sep; 13(3):401-2. A delayed diagnosis that altered the professional orientation of an athlete with upper limb chronic arterial embolization. Ioannou CV, Kafetzakis A, Kounnos C, Koukoumtzis D, Tavlas E, Kostas T. Med Sci Monit. 2012 Jan; 18(1):CS1-3. Studying the expansion of small abdominal aortic aneurysms: is there a role for peak wall stress? Georgakarakos E, Ioannou C, Papaharilaou Y, Kostas T, Kozyrakis G, Katsamouris A. Int Angiol. 2011 Oct; 30(5):462-6. Computational evaluation of aortic aneurysm rupture risk: what have we learned so far? Georgakarakos E, Ioannou CV, Papaharilaou Y, Kostas T, Katsamouris AN. J Endovasc Ther. 2011 Apr; 18(2):214-25. Fondaparinux for the treatment of superficial-vein thrombosis in the legs.Decousus H, Prandoni P, Mismetti P, Bauersachs RM, Boda Z, Brenner B, Laporte S, Matyas L, Middeldorp S, Sokurenko G, Leizorovicz A; CALISTO Study Group.N Engl J Med. 2010 Sep 23; 363(13):1222-32. External jugular vein aneurysm: a source of thrombotic complications. Ioannou CV, Kostas T, Tsetis D, Georgakarakos E, Gionis M, Katsamouris AN. Int Angiol. 2010 Jun; 29(3):284-5. Comment on "the influence of wall stress on AAA growth and biomarkers". Georgakarakos E, Ioannou CV, Kostas T, Katsamouris AN, Papaharilaou Y. Eur J Vasc Endovasc Surg. 2010 Jun; 39(6):796; author reply 797. 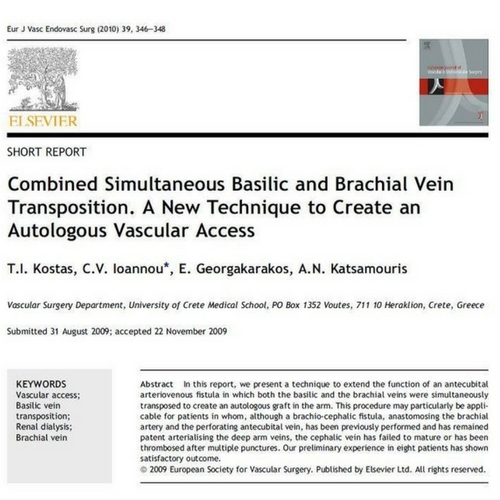 Combined simultaneous basilic and brachial vein transposition. 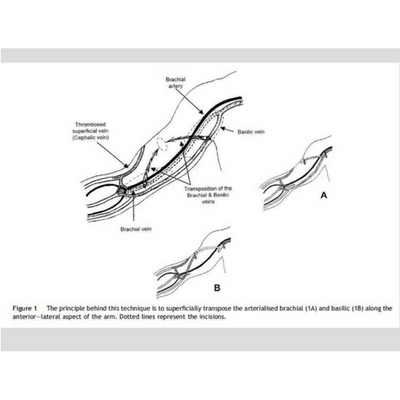 A new technique to create an autologous vascular access. Kostas T, Ioannou CV, Georgakarakos E, Katsamouris AN. Eur J Vasc Endovasc Surg. 2010 Mar; 39(3):346-8. Peak wall stress does not necessarily predict the location of rupture in abdominal aortic aneurysms. Georgakarakos E, Ioannou CV, Papaharilaou Y, Kostas T, Tsetis D, Katsamouris AN. Eur J Vasc Endovasc Surg. 2010 Mar; 39(3):302-4. Caval migration of a ureteral J-stent after simultaneous ureter and iliac vein perforation during its placement for obstructive pyelonephritis. Ioannou CV, Velegrakis J, Kostas T, Georgakarakos E, Touloupakis E, Anezinis P, Katsamouris AN. Int Angiol. 2009 Oct; 28(5):421-4. Endovascular treatment of a ruptured profunda femoral artery branch after fogarty thrombectomy of a femoro-femoral crossover arterial graft: a case report and review of the literature. Manousaki E, Tsetis D, Kostas T, Katsamouris A. Cardiovasc Intervent Radiol. 2010 Feb; 33(1):182-6. The appropriate length of great saphenous vein stripping should be based on the extent of reflux and not on the intent to avoid saphenous nerve injury. Kostas TT, Ioannou CV, Veligrantakis M, Pagonidis C, Katsamouris AN. J Vasc Surg. 2007 Dec; 46(6):1234-41. 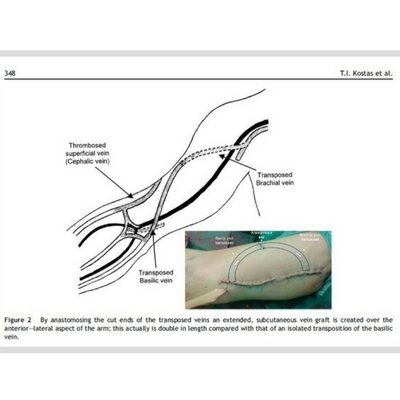 Use of the Trellis Peripheral Infusion System for enhancement of rt-PA thrombolysis in acute lower limb ischemia. Tsetis DK, Katsamouris AN, Androulakakis Z, Chamalakis K, Kostas T, Chlapoutakis K, Gourtsoyiannis NC. Cardiovasc Intervent Radiol. 2003 Nov-Dec; 26(6):572-5. 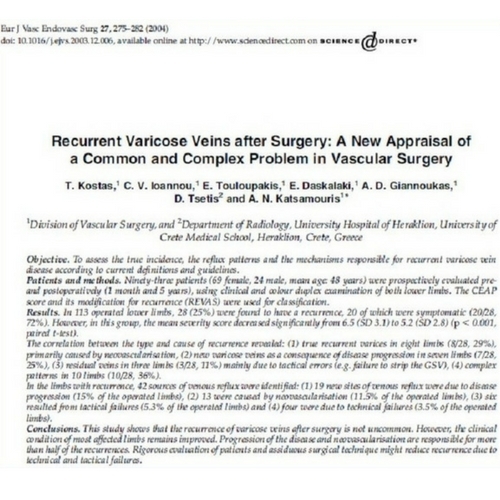 Recurrent varicose veins after surgery: a new appraisal of a common and complex problem in vascular surgery. Kostas T, Ioannou CV, Touloupakis E, Daskalaki E, Giannoukas AD, Tsetis D, Katsamouris AN. Eur J Vasc Endovasc Surg. 2004 Mar; 27(3):275-82. Potential benefits from heating the high-dose rtPA boluses used in catheter-directed thrombolysis for acute/subacute lower limb ischemia. Tsetis DK, Katsamouris AN, Giannoukas AD, Hatzidakis AA, Kostas T, Chamalakis K, Ioannou C, Gourtsoyiannis NC. J Endovasc Ther. 2003 Aug; 10(4):739-44. Patterns of venous reflux in limbs with venous ulcers. Implications for treatment. Ioannou CV, Giannoukas AD, Kostas T, Kafetzakis A, Liamis A, Touloupakis E, Tsetis D, Katsamouris N. Int Angiol. 2003 Jun; 22(2):182-7. Suspected acute deep vein thrombosis of the lower limb in outpatients: considerations for optimal diagnostic approach. Giannoukas AD, Tsetis D, Kostas T, Petinarakis I, Ioannou C, Touloupakis E, Katsamouris AN. World J Surg. 2003 May; 27(5):554-7. Epub 2003 Apr 28. Perforator reflux and clinical presentation in primary superficial venous insufficiency. Giannoukas AD, Kostas T, Ioannou Ch, Tsetis D, Gogas Ch, Kafetzakis A, Touloupakis E, Katsamouris AN. Eur J Vasc Endovasc Surg. 2003 Jan; 25(1):88-9. The initial management of scapulothoracic dissociation: a challenging task for the vascular surgeon. 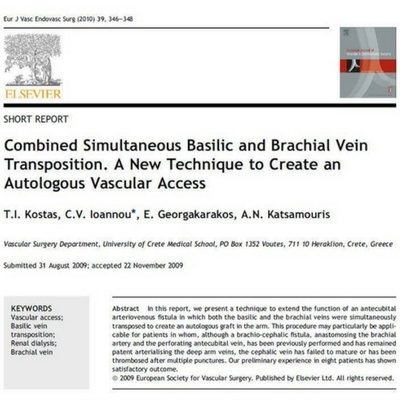 Katsamouris AN, Kafetzakis A, Kostas T, Tsetis D, Katonis P. Eur J Vasc Endovasc Surg. 2002 Dec; 24(6):547-9. Clinical presentation and anatomic distribution of chronic venous insufficiency of the lower limb in a typical Mediterranean population. Giannoukas AD, Tsetis D, Ioannou C, Kostas T, Kafetzakis A, Petinarakis I, Kardoulas D, Touloupakis E, Katsamouris A. Int Angiol. 2002 Jun; 21(2):187-92. Can ultrasound replace arteriography in the management of chronic arterial occlusive disease of the lower limb? Katsamouris AN, Giannoukas AD, Tsetis D, Kostas T, Petinarakis I, Gourtsoyiannis N. Eur J Vasc Endovasc Surg. 2001 Feb; 21(2):155-9.